The x-ray attack is implemented by attacking a piece through the body of another. Follow the examples below so you can better understand this concept. In the position below White moves 1. Bb3+ Kh8. 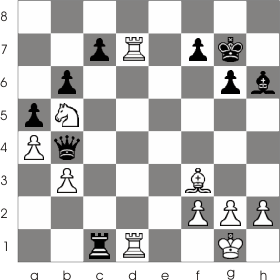 With this move White placed the bishop in a position were he can execute the following x-ray attack :Bd5. Now you can understand why this attack is called x-ray: the Black queen and the rook from a8 are on the same diagonal; when the bishop attacks the queen she will be moved but the rook will, nevertheless, remain under the bishop's scope (It's just like attacking the rook through the body of the queen). After the queen is moved, the rook will be captured. In the next example Black moves 1... Qb4-e1+. 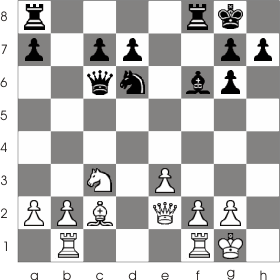 The queen is supervised by the rook from c1 through the white rook's body. Therefor 2. Rd1:e1 Rc1:e1 checkmate! Here is a position you may run into in your endings. You probably know that usually, in the rooks and marginal pawns endings, the marginal pawns don't get promoted. The position below is an exception to this rule. Black moves 1...Ra3+. 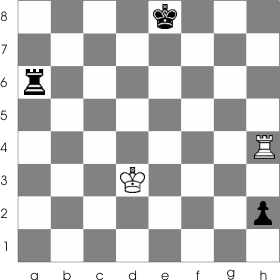 The white king can't move to the 4th rank because then with 2...Ra4 Black would perform an x-ray attack on the white rook over the king. The king can only be moved to the 2th rank; 2. Kc2 Ra1. Black is about to promote his pawn. White can't capture the pawn because Black would just apply the x-ray attack: 3. R:h2 Ra2 4.Ke1 R:h2 and Black loses the rook. As you can see, White has no defense; he will lose this game.